The reformer, the moderate and conservative: three synagogues close to other in the 7th district of the city. There’s one in Kazinczy Street, another in Rumbach Sebestyén Street and the fifth biggest in the word is in Dohány Street, which contains a museum of Jewish history, too. Earlier Jewish merchants lived in Gozsdu courtyard which could luckily retain its former atmosphere. The Holocaust Memorial Centre in Páva Street is oneof the museums to deal solely with the Holocaust. The shoes made of cast iron between Széchenyi István Square and Kossuth Square on the Pest side of the Danube are an absurd and movingly beautiful sight. They commerorate those who were shot inti the Danube by the Arrow Cross. Did you like The Jewish Monuments? Please share your opinion below or rate it at the top! Have you got any Budapest or The Jewish Monuments related question? Please have a look at our Questions & Answers section! Take a look at the Menu "Attractions" to see what other tourist sights are around. Click for Google Route Planner here. 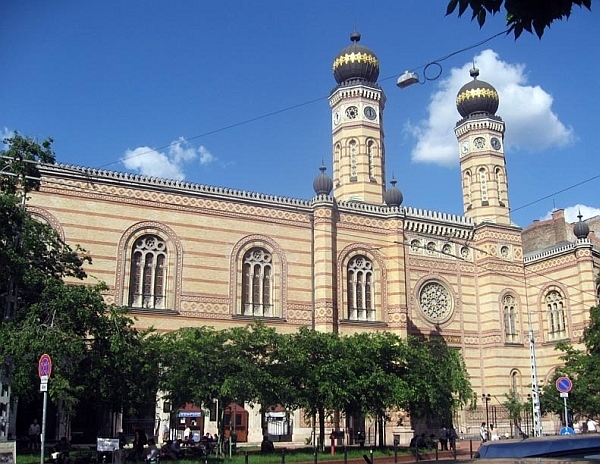 There is an easy way how to link to our Budapest guide & maps about The Jewish Monuments, ready to use on your website. Simply copy & paste the HTML code below into your page source code. Thank you for all links to Budapest travel guide! Great synagogue in Dohány street The largest synagogue in Europe was built between 1854 and 1859 following plans by Ludwig Förster. Your FREE source of the most useful Budapest related information & Budapest Travel Guide.